FOR SALE BY OWNER: One complete 5.1 surround-sound system with two tower speakers, subwoofer, rear surrounds, and a 7.1-capable A/V receiver. Great condition. Reason for selling: No longer needed. Discovered Samsung Harman/Kardon HW-N950. Extreme reaction? Perhaps. But it is a valid reaction to my time spent with Samsung's latest flagship soundbar--although calling it a soundbar seems somewhat disparaging given its impressive capabilities, features, and sound. The HW-N950 is more aptly described as a 7.1.4 soundbar system that ticks off all the boxes. It is the first offspring produced by Samsung's marriage to Harman/Kardon, which it acquired when it purchased Harman International in March 2017. 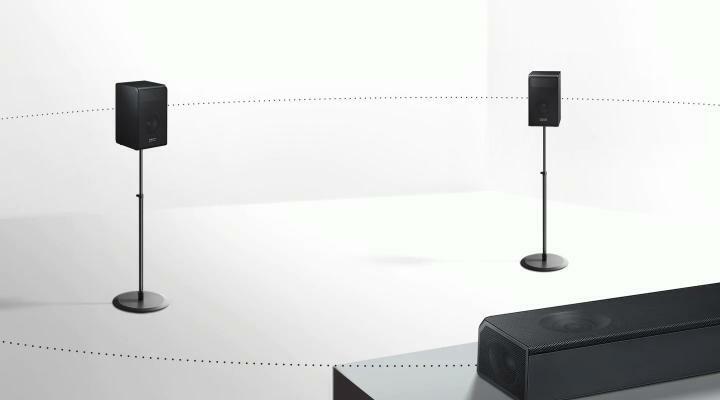 Its aesthetics, features, and ease-of-setup-and-operation should meet or exceed the expectations of any soundbar buyer. It supports all the latest audio formats, including immersive, object-based Dolby Atmos and DTS:X. And, like most contemporary high-end soundbars, it has the ability to pass a 4K signal from a source to a compatible TV. My own aging audio system lacks those features. It sounds great, but so does the HW-N950; killer sound is one of its greatest attributes. The HW-N950 is brawny by contemporary soundbar standards, though. The main bar measures 48.3 by 3.3 by 5.3 inches and weighs 19.4 pounds. Its width and depth dictate placement on a roomy entertainment center or sturdy wall (mounting hardware is included). But the main bar fit nicely on my roomy BDI entertainment center and looked right at home in front of my 70-inch Vizio TV. I placed the similarly beefy subwoofer (brawny by soundbar standards at 8 by 15.7 by 16.4 inches and 21.2 pounds) alongside the BDI unit and placed the two satellite speakers (8.2 by 4.7 by 5.7 inches; 4.4 pounds each) on shelves about 12 feet apart and 13 feet from the plane of the soundbar. The system features wireless connectivity between the sats, sub, and main bar, but like most modern systems each component needs to be plugged into a 110-volt AC outlet. I did that--using the included six-foot power cords--in the sequence specified by Samsung: subwoofer, satellites, main bar. Within seconds of plugging in the main bar, the sats and sub automatically connected to it. The setup was as quick and straightforward as I've experienced; the sats and sub don't even have power switches. There's a button on the back of each component that can be used if the components don't connect automatically, but I never needed it. Even when I unplugged components randomly to see what would happen, each one dutifully reconnected itself to the soundbar as soon as it was plugged in again. If your TV has an HDMI input labeled "ARC" (Audio Return Channel), the only other task necessary to begin using the HW-N950 is to connect an HDMI cable from it to the main bar's HDMI OUT (TV-ARC) connector. Samsung recommends doing this with both the TV and soundbar turned on. There are three other connectors on the back of the main bar: two HDMI inputs for devices such as a game system or Blu-ray/DVD player and a digital audio (Toslink) input. All of the HDMI connections support 3D and 4K HDR10/Dolby Vision. Unlike some soundbars, the HW-N950 lacks a 3.5mm analog input jack, but who is really going to miss it? Especially when you play your first Dolby Atmos or DTS:X-enabled movie and become immersed in the HW-N950's sound. The system's frequency response is rated at 34Hz-17kHz, and it employs 17 drivers to form an array of 12 speakers. The main bar contains an upward and a side-firing speaker at each end, and nine more forward-firing drivers (two woofers and one tweeter for each of the left, center, and right channels). Each of the surround speakers contains two full-range drivers: one forward- and one upward-firing. The subwoofer is comprised of an 8-inch, side-firing woofer powered by a 162-watt amplifier. The other speakers are driven by a total of 350 watts. Check out the specs on Page 38 of the user's manual if you're curious about how that power is distributed. After hearing the HW-N950 in action, it didn't really matter to me. The Dolby Atmos soundtrack of John Wick: Chapter 2 told me everything I needed to know about the Samsung soundbar's capabilities. If you ever wondered how much great audio adds to your appreciation of a film, the sound effects in the Wick sequel definitively answer that question. I viscerally felt the concussive force of the explosion and the pricks of glass shards as Keanu Reeves' character gets blown throw a picture window and out of his house by a rocket-propelled grenade. I wanted to duck as I scampered with Wick through Rome's catacombs, trying to elude assassins whose bullets whizzed over my head and ricocheted behind me off the cavern's walls. And, as if the HW-N950 wanted to prove it could convey subtle as well as spectacular, it made me feel like I was one of them during the scene portraying a room filled with operators plugging and unplugging their switchboards, chattering on their phones, and clacking on their typewriters. Dialogue was also rendered clearly, too, even when Reeves spoke in low, emotionless tones. But it was the film's special effects, of course, that best highlighted the benefits of the HW-N950's upward- and side-firing speakers. They filled the fairly large (about 25 by 16 feet wide) room with sound like I've never experienced before, despite the room being less-than-ideal for bouncing audio waves off the walls and ceiling. The ceiling is just 8 feet high, but it slopes away from the soundbar at the front of the room. There is a nice, full wall about 10 feet to the left of the soundbar, but the right side opens to a hallway. Yet whether I was listening to knives slashing at the air or bullets whizzing overhead, the directional movement was remarkably realistic. The HW-N950 did a nice job handling music, too, albeit not quite as impressively as it delivers movie sound effects and dialogue. Listening critically to the Dolby Digital soundtrack of the musical Chicago, I found that I wanted the bass a little tighter and the instruments and imaging just a bit sharper. But I'm admittedly stretching to find fault. The simple fact is that I thoroughly enjoyed listening to the movie through Samsung's HW-N950, from Catherine Zeta-Jones' raucous rendition of "All That Jazz" to Queen Latifah's whimsical delivery of "When You're Good to Mama." The Samsung HW-N950 delivers simple setup and intuitive operation through a convenient remote that's comfortable to use. The entire kit benefits from subtle yet elegant design and solid build quality. With three HDCP 2.2-certified HDMI 2.0 connectors with one ARC-compatible output, 4K HDR pass-through, and a TosLink optical input, the HW-N950 is well-equipped in terms of physical connectivity. Built-in Bluetooth audio and Wi-Fi music streaming with UHQ 32-bit upscaling cover all the bases in terms of wireless connectivity. The system also boasts SmartThings control and Amazon Alexa compatibility (with optional Echo device). Due to its driver configuration, the system renders amazingly immersive, 7.1.4-channel, object-based sound, even in an oddly shaped room. One size might not fit all: The large main bar's dimensions and weight might not work for you. The main bar's built-in display is small and low-res. It can be tough to read from a distance, a potential problem since it's the only way to control many of the functions. This can easily be the shortest section of this review because, quite simply, as of this writing Samsung's HW-N950 has no peers. Choose "compare" on Amazon and you'll note that only other Samsung soundbars pop up. Dig a little deeper and you'll see that all of the current alternatives fail to match up on the spec sheet. For example, LG's SK10Y ($850) is a 5.1.2 system that, like the HW-N950, includes both front side- and up-firing speakers in its main bar. But its optional SPK8-S surrounds ($160) lack the Samsung satellites' up-firing drivers. Vizio's SB46514-F6 ($1,000) 5.1.4 system has those, but lacks side-firing drivers in the main bar. The same is true of Sony's HT-ST5000 ($1,500), which also lacks rear surrounds and achieves its 7.1.2 status through digital signal processing. After experiencing the HW-N950, I see no reason to keep my current component sound system. Hi-res music sounds slightly better on my system than the Samsung, but I spend very little time intently listening to that. Unlike many consumers who gravitate toward soundbars because they don't have room for a bulky receiver and multiple speakers or don't care to deal with a receiver remote that has as many buttons as a space shuttle cockpit, I have no shortage of room or patience. But I've grown tired of sucking dust bunnies out of the tangled web of wires that connect my speakers and subwoofer to the receiver. Also, soon after returning the HW-N950 test unit to Samsung, I found myself missing its truly enveloping and dynamic 360-degree audio. Craigslist, here I come. Samsung Harman/Kardon HW-N950 Soundbar Reviewed Can a soundbar ever truly replace a component home theater system? Polk Audio Command Bar Sound Bar System with Amazon Alexa Reviewed What's not to like about having a digital voice assistant built into your soundbar? Not much, says Scott Wasser. Sony HT-Z9F Sound Bar and SA-Z9R Wireless Surround Speakers Reviewed Immersive object-based surround sound from a soundbar with minimal setup muss and fuss? Seriously? Scott Wasser says it's totally a thing thanks to Sony's HT-Z9F/SA-Z9R combo. Integra DLB-5 Object-Based Soundbar System Reviewed Myron Ho auditions Integra's DLB-5 object-based soundbar system, which combines a standalone AV receiver, Atmos-friendly soundbar, and wireless subwoofer to deliver more flexibility and options than your average powered soundbar.